Daniel McMillan emigrated from Ireland to Williamsburg township, Dundas county, previous to 1830, and settled on lot 19, concession 7, where he made the first clearing. His brother David came out in 1837, and settled on lot 13, concession 8, of that township. As we shall see, Daniel McMillan in fact came to Canada in 1822. It is certain from contemporary records that his brother (and our ancestor) David McMillan was in Canada by 1839; and from 1852 until his death he too is found in Williamsburg Tp. It seems impossible to state whether the two brothers came to Canada at the same time. The place where they settled was near the future site of the village of Armstrong’s Mills, later renamed Chesterville. Their widowed mother, Betty/Betsy, also came to the area by 1852. A major source for this family is the records of St. Andrew’s Presbyterian Church, Williamburg, in which the surname occasionally appears as McMullen. A particularly valuable source has been Dundas County Cemeteries: Old Williamsburg, transcribed by Lynne & Mahlon Cook (Morrisburg, Ontario, 1995), which is extensively annotated with extracts from vital records and death notices. This work is now available online. Also, all census records of Williamsburg Tp. between 1852 and 1891 have been searched sequentially. The Dundas County marriage registers supply a few entries for McMillans of Williamsburg during the period of 1869-1886, although oddly there is not a single one during the early period of 1858-1869. It should be noted that by a rather remarkable coincidence, two men in this family, an uncle and a nephew named both James Henry McMillan (nos. 5.i and 7), each married women named Margaret Barkley. As a direct matrilineal descendant of Frances MacAulay (d. 1887), wife of David McMillan, I have been able to provide a genetic sample for mitochondrial DNA (mtDNA) testing of her lineage. The results of this test, performed by FamilyTreeDNA, which identified her haplogroup as T2b3e, have been submitted to the publicly-accessible database Genbank (where it appears as entry http://www.ncbi.nlm.nih.gov/nuccore/JF837334 with the haplogroup indicated as T2b3a1). My understanding is that unless the mtDNA match is exact, there is little possibility of two persons being related to one another within historical times. I am grateful to my closest match, Marilyn Nevala, who informs me that her maternal line comes from St. Johnston in co. Donegal, which is near the border with co. Derry, providing welcome corroboration of the statement that Frances (MacAulay) McMillan came from that area. Mark McMillan, of Chesterville, Ontario, for supplying a record of the descendants of Roy McMillan and Myrtle Perminda Barkley. Sylvia Darlene (McMillan) Brown, of Carleton Place, Ontario, for a record of the descendants of William Hill McMillan and Margaret Ann Beckstead; she is the author of a very interesting and richly illustrated McMillan and Harris Family Tree. Rocky Kile, of Winnipeg, Manitoba. Wallace McMillan, of Tsawwassen, British Columbia. Caryn Moore, a granddaughter of Elsie (McMillan) Johnstone, author of the Oswegatchie Roots (formerly North Country Roots) website (see references at end), which covers the McMillan-Johnstone lines in depth, and who sent much valuable material including a copy of notes made in the 1970s by her cousin, H. Rae Myers (1925-2002), another grandson of Elsie (McMillan) Johnstone. K. Stuart Keys, of Lloydminster, Alberta, a descendant of Agnes (McMillan) Sullivan, who sent information on his line and also supplied a copy of the 1822 passenger list mentioning Daniel McMillan and Nancy Mooney. Jane (Young) Tatlock, for placing me in touch with Mary Jeanne Kurtz. Mary Jeanne “Jeannie” Kurtz, who graciously gave permission to publish the document in her possession concerning the spinning-wheel that belonged to Betty/Betsy (Reid) McMillan, and provided a copy of a family photograph. Tom Brown and Roy Weir, Brown and Knight descendants respectively, who sent information on Margaret Jane Brown, wife of Howard McMillan. Pamela Longhurst Romanchuk, who sent information on the marriage date of Alge Retta McMillan and John Milton Carkner. Jeff Oshier, who is descended from a brother of George Henry Oshier, who married Hattie McMillan. 1. ____ McMillan, of Ireland, for whom we have found no indication that he ever came to Canada. He married, apparently in 1786 (see below), Betty/Betsy Reid, born 1769-70 (aged 82 in 1852) in Ireland, perhaps in Antrim (see below), died in Canada, probably before the beginning of civil registration in 1869. As Betsy McMullen she is found in the household of her son-in-law Robert Hyndman in the 1852 census of Mountain Tp., Dundas Co., along with a 22-year-old William McMullen who is presumably her grandson, no. 4 below. She is thus almost certainly the unnamed member of Hyndman’s household who died in 1860 at the age of 94 years, of old age. Unfortunately, the burials records of St. Andrew’s Presbyterian Church, Williamburg, appear to be missing for 1859-1875, though they survive for both earlier and later years. No tombstone survived for her in Old Williamsburg Union Cemetery when the memorials were recorded in 1995. Made in Ballamana [i.e. Ballymena, in the barony of Toome?]. Antrim County. Ireland. 1782. Wedding gift to Betty McMillan nee Reid 1786. Came to Canada 1836 on board the sailing vessle [sic] “British Merchant” sailing from Liverpool to Quebec time of voyage 6 weeks 3 days. Wedding gift to Jane Hyndman nee McMillan 1838. Gift to Hattie McMillan 1895. 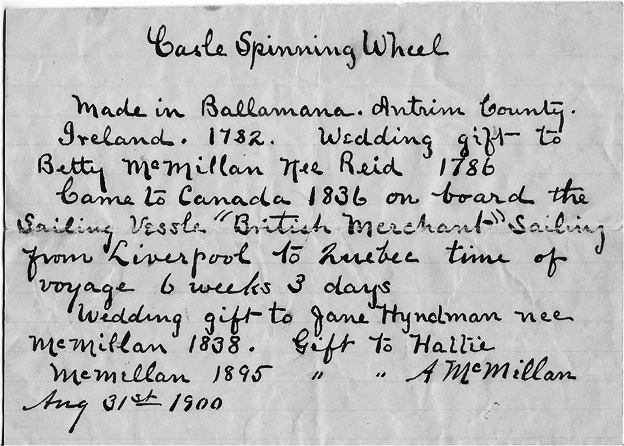 [Gift to] A. McMillan Aug. 31st 1900. Considering that Betty’s son David is said to have come to Canada in 1837, perhaps mother and son really came on the same ship. Hattie was Harriet “Hattie” McMillan, who married 28 December 1896, George Henry Oshier, and the memorandum was written by her brother, Angus McMillan. Unfortunately, the present whereabouts of the spinning-wheel is unknown. 2Daniel McMillan, born probably ca. 1791-92 in Ireland. 3David McMillan, born probably ca. 1791-92 in Ireland. Jane McMillan, born probably in 1800-03 (aged 44 in 1852, 53 in 1861, 67 in 1871, 78 in 1881, 95 in 1895), reportedly at Dunglady, in the parish of Magherafelt and barony of Loughinsholin, co. Derry, Ulster, Ireland, died (probably without surviving issue) 16 March 1895 in Williamsburg Tp., Dundas Co., Ontario, aged 95 years, of old age, and buried in South Gower Cemetery, near Kemptville, Grenville Co., Ontario, where a tombstone survived in the late twentieth century. Her death record gives her religious denomination as Presbyterian, and the name of the informant as Daniel McMillan, of Williamsburg (presumably no. 6 below, for reasons previously given). An unfortunately brief death notice in the local newspaper reads (in full): “The remains of Mrs. Robt. Hyndman, an aged lady, were buried in South Gower cemetery on Monday. She had reached the age of nearly 90 years.” Her tombstone, which provides welcome proof of her maiden surname, reads: “Jane McMillan, wife of Robert Hyndman, died Mar. 16, 1895, aged 95 years.” She married in 1838 (according to the memorandum concerning her mother’s spinning-wheel) or in 1841 (according to the 1861 census), Robert Hyndman, born probably in 1792-93 (aged 59 in 1852, 63 in 1861), reportedly at Dunglady, died (probably without surviving issue) in 1862 (the date on his tombstone, which gives a probably inflated age for him of 75 years), and buried in South Gower Cemetery, son of Samuel Hyndman and Margaret Clark, of Mountain Tp., Dundas Co. While Robert Hyndman’s parents and most or all of his siblings eventually came to Mountain Township, their arrival must have entailed at least four separate migrations, with Robert’s seemingly occurring after the birth of his daughter Martha, allegedly in Ireland, in the early 1840s. Possibly the first to arrive, about 1828, was his younger brother, Joseph Alexander Hyndman (1807-1897), whose death notice states that the deceased “was born in Ireland in 1808, married when 20 years of age, [and] a few months later came to Canada, and settled on the farm where he spent all the remainder of his life.” If strictly true, he and his immigrated in 1828. Next, his parents (or at least his father, who certainly died in Canada in 1843), is probably alluded to in the statement respecting another early settler of Mountain Township, Hezekiah Clark, who having “constantly resided therein for over three score years” must have arrived by 1836, and is described in his death notice as “a native of the north of Ireland … [who] came to this country with his parents and the Hyndmans, also from County Antrim.” Finally, census entries for Robert’s youngest brother William James Hyndman (1813-1887), reveal in the birthplaces reported for his children that he did not come to Canada until about 1855. Robert Hyndman is recorded once as “Robert Hindman” and once as “Robt. Hyndman” in the 1852 census of Mountain Tp., Dundas Co., in which, as previously noted, his wife’s mother and nephew appear with them; but there are no children in the household. As Robert Hyndman, Snr., farmer, with wife Jane, he is recorded in the 1861 census of the same place; the entry states that a member of their household had died in 1860 at the age of 94 years, of old age. The widow Jane Hyndman appears in the household of her brother-in-law, William Hyndman, in 1871, and she is found as Jane Hyndman, widow, aged 78, born in Ireland, of Irish origin, Canadian Presbyterian, in the 1881 census. She is doubtless the “Mrs. Hyndman” shown on a 1879 map as the owner of lot 7 in the 7th concession of Mountain Tp., because the tract was the site of a church, as would be accounted for by a donation of land for such a purpose made many years earlier by her deceased husband (see below). On the 13th ultimo [i.e. October] the new Presbyterian Church belonging to the united Congregation of South Gower, Mountain and Oxford, in connection with the Church of Scotland, and under the pastoral care of the Rev. Mr. Anderson, was opened for divine service by the Rev. John Dickey, of Williamsburgh [sic]. The place of worship is built on a site bestowed by Mr. Robert Hyndman in Mountain. Martha Hyndman, born 1841-42, reportedly at Dunglady aforesaid, died 1851 in Mountain Tp., Dundas Co., aged 9 yrs, 6 months, and buried in South Gower Cemetery. This final statement appears to be substantiated by the manifest, dated 27 July 1822, of a steamboat running from Quebec City to Montreal, in which the names of Daniel McMillan and “Nancy Money” appear in sequence; no other recognizable family members appear with them. We have already quoted The Story of Dundas to the effect that Daniel McMillan “emigrated from Ireland to Williamsburg township … previous to 1830, and settled on lot 19 [sic], concession 7, where he made the first clearing.” The list of Crown grants in the same work shows him as the patentee of the whole lot in 1840. He appears in the census of 1852, in which he is called a farmer and his religion given as Presbyterian. We have not found his widow in the 1861 census. (possibly) Sarah Beckstead, called “daughter of Charles Beckstead” in her husband’s obituary. She married Norman I. Weaver, born 2 December 1842, died 28 February 1911, and buried in Old Williamsburg Union Cemetery, by whom she had issue. Much more is given on this family in an editorial note in Dundas County Cemeteries: Old Williamsburg, p. 21. Mary Ann Beckstead, born 25 May 1853, baptized 21 August following in St. Andrew’s Presbyterian Church, Williamburg, the surname being distinctly written “Bedstead” in the record. Alan Beckstead, born 1852-53 (aged 18 in 1871), living unmarried with his parents in 1871, but no longer in their household in 1881. We have not located him in the LDS transcription of the 1881 census. Daniel Wesley Beckstead, born 4 June 1856, baptized 20 July 25 following in St. Andrew’s Presbyterian Church, Williamburg, the surname being distinctly written “Bedsted” in the record. He living unmarried with his parents in 1881, when he was a farmer. Nancy Beckstead, born 1858-59 (aged 12 in 1871). Ruth Beckstead, born 29 April 1863, died 15 September 1868, and buried in Old Williamsburg Union Cemetery. Rose M. Beckstead, born 20 October 1866, died 15 September 1868, on the same day as her sister Ruth, beside whom she is buried. John Beckstead, born November 1870 (aged four months in 1871; birthdate stated as November). 4William McMillan, born 10 August 1828 in Ontario (at Elma, according to his death record). 5John McMillan, born 24 April 1830. Agnes Droppo, born 12 April 1857 in Finch Tp., baptized 7 June following in St. Andrew’s Presbyterian Church, Williamburg as a daughter of William and Jane Dropeau; died by 1870, when another daughter was given the same name. Daniel Droppo, born 1859-60, died 1924 at Okotoks, Alberta. He was living unmarried with his parents in 1881, but subsequently married Catherine McDougall, and had issue. James Droppo, born 29 May 1864 in Finch Tp., who apparently went to Waddington, New York. He was living unmarried with his parents in 1881, but subsequently married Elizabeth Munro, and had issue. Allen N. Droppo, born 1864-65, living 1881. Alexander Droppo, born 18 May 1866 in Finch Tp., living 1881. Agnes Droppo, born 1869-70 in Finch Tp., died 1950 at Chesterville, Dundas Co., and buried in Maple Ridge Cemetery. She married 1 November 1893 at Chesterville, John Banford Merkley, born 1859-60 (aged 23 at his marriage) at Chesterville, son of John Merkley and Catherine McKindley. Their marriage record gives her residence as Finch Tp. and his as Chesterville, and names both sets of parents; the witnesses were William Harris of Montreal and B. Conlan of Chesterville. They lived at South Mountain, Ontario, and had issue. Peter Droppo, born 9 March 1872, married 17 November 1897 in Pleasant Valley United Church, Grantley, Williamsburg Tp., Sarah Ellenor Joynt, whose surname is spelt Joint in the record. 6Daniel McMillan, Jr., born 8 December 1836. Mary McMillan, born probably in 1839-40, died unmarried 19 February 1895 in Williamsburg Tp., of cancer, aged 55 years, the death being reported by (her brother) Daniel McMillan of Williamsburg. She was living in the household of her brother Daniel in 1881 and 1891. She is probably the Mary McMullin, single woman, aged 32, who was living as a servant in the household of James Hawan (?) in 1871. 7James Henry McMillan, born 2 February 1841. William (Percy) Nephew, born ca. 1860, who went to Syracuse, New York, married Jesse Penoyer, and had issue. Myles Nephew, born ca. 1862, who married and had issue. He is not found with his parents in 1881. Sarah Jane Nephew, born 1861, died (unmarried) 1951, and buried with her parents. She was living unmarried with her parents in 1881. John Henry Nephew, born 19 May 1865 (1863? ), died 1947 in Finch Tp., and buried in Goldfield Cemetery. He married Mary Elizabeth Carr, born 1871, died 1951, and had issue. Martha Nephew, born 27 March 1867 in Finch Tp., baptized 8 July 1868 in St. Andrew’s Presbyterian Church, Williamburg. She married Robert Brady, and had issue. Daniel Nephew, born ca. 1869. He married 9 September 1898 at Avonmore, Carrie McMonagle, and had issue. Delia Nephew born ca. 1871. She married George Gallagher, and had issue. Orlen Nephew, born 1873-74 (aged 7 in 1881), living 1881 but probably died young. Willburn Nephew, born ca. 1876. He married, and had one son. Edith Nephew, born ca. 1880. She married Gus Smith, and had one son. 3. David McMillan, of Williamsburg Tp., Dundas Co., U.C., born probably ca. 1791-92 in Ireland, died some time in 1871-81 (aged at least 80 years); but his death appears to have gone unrecorded. He married before 1830, presumably in Ireland, Frances “Fanny” MacAulay, born probably ca. 1805-08, in “County Derry” (the original and restored name of the county for some time known as Londonderry), Ireland (according to her death record), died 21 June 1887 of “old age.” Her own death record fails to supply her maiden surname, but she is named as Fanny MacAulay in that of her daughter Mary Jane (McMillan) Young. We follow this nearly contemporary evidence against the statement of her husband’s great-great-grandnephew, Rae Myers, that her name was Frances Cawley (his observation that in the 1861 census a James Cawley, born about 1839, was working for the widow of David’s brother Daniel, is likely only a coincidence, as the surname was not uncommon in the area). Given the facts that we first find his wife Frances recorded with him in 1852, and that there is a gap of some five years between the birthdates of his fourth and fifth children, we cannot be absolutely certain that she was the mother of all of his children; but she is named as the mother of his daughter Jane in the latter’s marriage record. 8George H. McMillan, born 17 March 1830 in Ireland. Nancy McMillan, born ca. 1832-33 (aged 19 in 1852) in Ireland, living unmarried with her parents in 1852, but not found with them in the 1871 census. She might perhaps be the Nancy McMillan (1831[? ]-1909) who married by 1860, James Perkins (1826[? ]-1901), and is buried with him and four children in St. James Anglican Church Cemetery, Morrisburg Village, Williamsburg Tp., but unfortunately there does not appear to be any corresponding death registration for her which might settle the matter. Such a marriage would involve a significant change of religious affiliation for our subject. The entry for this couple in the 1881 census shows her as a milliner, aged 48 years, and born in Ireland, in perfect agreement with the Nancy McMillan of 1852. Her husband was a customs officer, aged 50 years, and born in Ontario. It will be noted that these ages do not correspond to the birthdates shown for them on their tombstones. However, the ages of 59 and 64, respectively, stated for them in 1891, are compatible with their tombstones. While we have found no death record for Nancy (McMillan) Perkins, her husband James Perkins died 26 December 1901, and his death record gives his age at death as 75 years, his place of birth as Mille Roches, his occupation as painter, and his religion as Episcopalian; the name of the informant seems to be given as C.N. McMillan. 9Daniel C. McMillan, born ca. 1835-37 in Ireland. Frances (“Fanny”) McMillan, born ca. 1838-9 in Canada, living with her parents in 1852 but not in 1871. No marriage has been found for her. Elizabeth McMillan, born ca. 1842-4 in Ontario, living 1871, when she was still living unmarried with her parents. No marriage has been found for her. David McMillan, Jr., born ca. 1844-5 in Ontario, living 1871, when he was still living unmarried with his parents. He has not been found in later censuses of Williamsburg Tp. Mary Jane McMillan, born 30 November 1850 in Williamsburg Tp., died 24 June 1937 at Winchester, Winchester Tp., Dundas County, at the age of 86 years, 6 months, and 24 days, of “extreme age” and “complete physical & mental exhaustion” following a fractured femur, and buried in the Old Williamsburg Union Cemetery. She married 11 August 1875 at the Parsonage, North Williamsburg (the principal village of Williamsburg Tp. ), by license, Joseph Young, of Williamsburg Tp., born there 26 April 1846, living 1901, son of Samuel and Elizabeth (Clark) Young, of Williamsburg Tp., by whom she had issue. She was living with her parents in 1871. She and her husband appear in the 1891 and 1901 censuses of Williamsburg Tp. Their daughter, Susanna Samantha Helena Young, was the wife of John Kennedy (V), of Melita, Manitoba, and they were the great-grandparents of the present compiler. 4. William McMillan, son of Daniel McMillan, of Williamsburg Tp., by the latter’s wife Anne Mooney alias Thom, was born 10 August 1828 in Ontario (at Elma, according to his death record), died 6 January 1918, aged over 89 years, of a stroke and was buried in Elma United Church Cemetery, lot 23, concession 1, Williamsburg Tp. His death record names his parents as Daniel McMillan and ____ Thom. We have already quoted above the census entry in which he seemingly appears as a 22 or 24-year old in the 1852 census of Mountain Tp., Dundas Co., with his presumed aunt Jane (McMillan) Hindman, and his presumed paternal grandmother. He married before 1854, Delia Sipes, born 7 December 1837 in Ontario, died 1920, and buried with her husband, daughter of Andrew Sipes, Jr., probably of Matilda Tp., by the latter’ wife Maria, daughter of Edmund Doran. He appears in the 1871, 1881, and 1891 censuses, in which he is called a farmer and his religion given as Presbyterian. In all cases he is enumerated very close to his brothers John, Daniel, and James McMillan. He and his wife were enumerated again in 1901, and were living with their son William in 1911. Olive Luvia McMillan, born in August 1906; married Wilbert Lorne McLatchie. Lilla Pearl McMillan, born in September 1908, died 1990; married Milton Barkley. Alice Ethel McMillan, born 1912; married Alfred Herbert Lenser. Samuel Ellery McMillan, born 28 August 1886, died 1949. According to the Bonaccorso genealogy, he married Ruth Streeter. Martha McMillan, born ca. 1857, died (unmarried) 5 November 1915, aged 58 years, and buried with her parents. She was living with her father in 1871 but not in 1881. Alexander McMillan, born 8 February 1862, baptized (much later) 27 April 1865 in Williamsburg Tp., by Wesleyan Methodist rites; died 10 November 1928, aged 66 years, and buried with his parents. He was living unmarried with his parents in 1891, when he was a farmer, but was no longer with them in 1901. 10William Arthur McMillan, born 11 January 1870, died 28 June 1953. Bertha McMillan, born about 30 March 1883, died 9 June 1885, aged 2 years, 2 months, 9 days, and buried in Elma United Church Cemetery, Williamsburg Tp. 5. John McMillan, son of Daniel McMillan, of Williamsburg Tp., by the latter’s wife Anne Mooney alias Thom, was born 24 April 1830, died 11 August 1915, aged over 85 years, of “concussion of brain from … fracture of skull from a fall … [after] four hours,” and buried with his wife. His identity is well-established; he is found living unmarried with his parents in the 1852 census, and his death record gives the name of his parents as Daniel McMillan and Agnes Money. He married 16 October 1855, by the Rev. Benjamin Meeker, Methodist Episcopal minister, Permelia Armstrong, born 26 July 1834 in Ontario, died 19 October 1913, and buried in Old Williamsburg Union Cemetery, daughter of Henry Armstrong, of Williamsburg Tp., by the latter’s wife Margaret Barkley. His marriage record refers to him as “John McMullen” and her as “Permilla Armstrong.” The 1871 through 1891 censuses calls him a farmer, but that of 1901 calls him a “sargeant”; both give his religion as Presbyterian. They were also enumerated in 1911. Clifford S. Barkley, born 13 June 1915, died 17 August 1916. Garnet E. Barkley, born 1918, died 1941. Alfred McMillan, born 14 December 1882 (per 1901 census), died 1948. Elmer Fred S. McMillan, born 14 February 1885 (per 1901 census), died 1958. He married Wilda Eva Hess, born in August 1893, died 1983. They were enumerated in Williamsburg Tp. in the 1911 census. He is probably the Elmer McMillan, farmer, of concession 8, lot 28, near Winchester Springs, listed in the 1916-17 county directory. Stella Maud McMillan, born 14 February 1887 (per 1901 census). She married Mason O’Brien. Alice Retta McMillan, born 15 February 1890 (per 1901 census), died unmarried 27 March 1973, aged 83 years, and buried with her parents in Old Williamsburg Union Cemetery. She was still living with her widowed father in 1911. Mary/Nancy McMillan (name hard to read), born ca. 1857-8, living with her father in 1881 but not in 1891. Annie Mae Droppo, born 1881 (aged “0 months” at the taking of the 1881 census) in Ontario, died 1924, Campbellford, Ontario; married Adam Outingdyke. Mary Maud Droppo, born 1887; married Alton Heaslip. Reily Earl Droppo, born 1888. Pearl Droppo, born 1889; died 1937. She married 13 November 1924 at Chesterville, George Cross, born 1893 in Winchester Tp., died 1945, son of Silas Cross and Susan Ball. At the time of their marriage the groom was a farmer, of Winchester Tp. The witnesses were Fay Droppo and Mrs. Fay Droppo, both of Finch Tp. Fay Mills Droppo, born 1894; died 1970. He married Ella Mae Bogart. Stanley Droppo, born 1897; died 1948. He married Sadie Droppo. Albert Droppo, born 27 September 1901; married Bernilda M. Winters. 11George Melvin McMillan, born 10 May 1862, died 13 May 1950. Percy Peter McMillan, born 1892, died 1979. He married Stella M. Hollister, born 1902, died 1965. Emerson Blake McMillan, born 16 March 1894, died 1982. He married Edith Stewart. Sarah Luella McMillan, born 21 January 1898, died 1989. She married William Thomas Holmes, born 1890, died 1957. Otis Myles McMillan, born 5 May 1901, died 1990. He married Eva May Whittaker, born 1913, died 1989. Ena May McMillan, born about 1903; married John Belway, born 1902, died 1971. Carman Cornelius Barkley, born 1890, died 1965. He was still living unmarried with his widowed mother in 1911. Darwin Barkley, born 1893, still living unmarried with his widowed mother in 1911. John Bernard Barkley, born 25 January 1896, died 10 November 1937, aged 41 years. He is found with his widowed mother in 1901, but not in 1911. He married Edith Froats, born 1895, died 1985, who is buried at Los Angeles, California. Ezra Elton Barkley (called Elton in the 1911 census), born 1898, living 1911 but apparently died young. 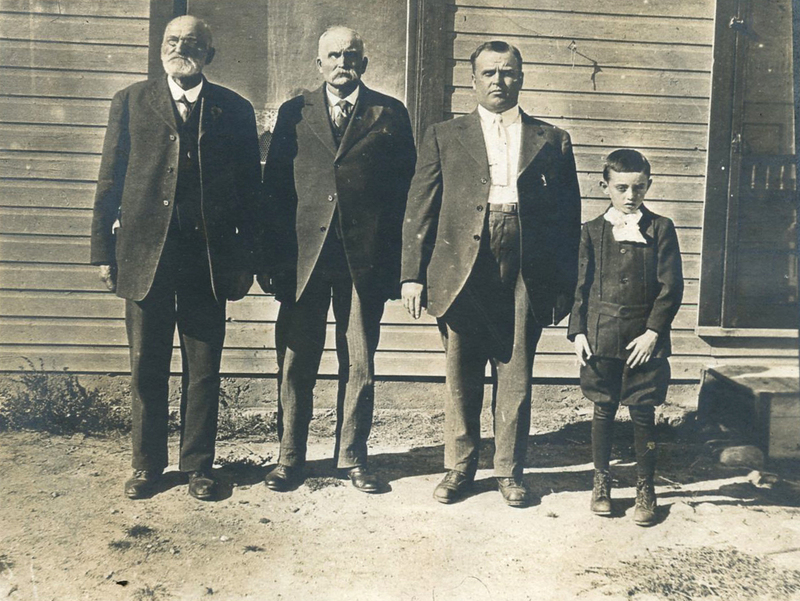 Daniel McMillan, Jr. (“Big Dan”), William Hill McMillan, J. Orlin Grant McMillan, and T. Grant McMillan. 6. Daniel McMillan, Jr. (known as “Big Dan” McMillan), of Dunbar, Williamsburg Tp., son of Daniel McMillan, of Williamsburg Tp., by the latter’s wife Anne Mooney alias Thom, was born 8 December 1836, died 18 April 1921, and was buried in Old Williamsburg Union Cemetery. According to the notes of Rae Myers, “This Daniel was known as Big Dan’ not because he was above average in size but because he was bigger than his first cousin little Dan’  son of David. Big Dan was a drover or dealer in live stock as well as a farmer.” He was married 1 Januay 1856 in St. Andrew’s Presbyterian Church, Williamburg, by license, to Susannah Hill, born 20 April 1834 in Ireland, died 6 July 1912, and buried in Old Williamsburg Union Cemetery, daughter of William Hill, of Williamsburg Tp., by the latter’ wife Margaret Allison. According to the “Our North Country Roots” website, he “inherited the big stone house and part of the 200 acre farm, lot 19, conc. 7, Williamsburg Township, just south of Dunbar.” He is listed with his wife and family in the censuses of 1871 through 1901, which give his occupation as farmer and religion as Presbyterian. In 1871 his mother Nancy was a member of his household, and in 1881 and 1891 it included his sister Mary, which helps to distinguish him from his cousin and exact contemporary, Daniel McMillan (no. 5). A photograph of this couple appears on the “Our North Country Roots” website. Jesse Elmer Sullivan, born in Jan. 1880 in Ontario, died 29 January 1968, and buried in Spruce Haven Cemetery, Brinston, Ontario. He married 21 January 1903 in the bride’s home, Phoebe Gertrude McIntosh. Annie Amelia Sullivan, born 14 Jan 1884 in Dundas Co., died about 1972, and buried in Spruce Haven Cemetery, Brinston. She married 26 June 1905 in Dundas Co., Kenneth Arthur Graham. Morley Roy Sullivan, born about 1889 in Dundas Co., died 17 January 1978 in Dundas Co. He married 24 December 1913 in Dundas Co., Cora Pearl Ross. 12William Hill McMillan, born 1857, died 1933. Abiah McMillan (female), born ca. 1859-60, living with her parents in 1881 but not in 1891. She is presumably the Abiah McMillan who died 1914, having married 6 August 1884 in Williamsburg Tp., Milo Knowland. According to the “Our North Country Roots” website, they had four children. Ernest B. McMillan, born 13 January 1893. He is probably the Ernest McMillan, farmer, of concession 7, lot 5, near Chesterville, listed in the 1916-17 county directory. Andrew A. McMillan, born 25 August 1895. Susannah E. McMillan, born 12 May 1897. Lillian Rose McMillan, born 16 October 1898. Alice McMillan, born 20 July 1901. Helen McMillan, born after 1901. Alice Mae Johnston, born 1888 in Ontario. Grace Johnston, born 1890 at the family homestead on lot 19, concession 7, Williamsburg Tp. Robert Smith Johnston, born 12 February 1892 at Dunbar, Williamsburg Tp. James Arnott Johnston, born 1 April 1896 at Nation Valley, Ontario. Harvey Rae Johnston, born 26 December 1900. John Grant Johnston, born 14 March 1906 at Bethune Bush, Winchester Tp. Emma Bell McMillan, born 13 July 1898. Frank Smith McMillan, born 16 October 1904. He married Hilda Eileen Casselman, born 15 December 1914, died 12 May 1975, and buried in Old Williamsburg Union Cemetery, daughter of Grant Merton Casselman and Emma Jane McIntosh. Eva May Mcmillan, born 28 August 1907. Ernest Andrew McMillan, born 20 April 1868, baptized (as “Andrew Ernest”) in St. Andrew’s Presbyterian Church, Williamsburg, died 28 August 1892, aged 24 years, 4 months, 8 days, and buried in Old Williamsburg Union Cemetery. He was living unmarried with his parents in 1891. As Andrew E[rnest] McMillan he married 16 March 1891 at Morrisburg, Williamsburg Tp., Martha E[llen] Beckstead, born 1866-67 (aged 26 in 1893), sister of his brother William’s wife, and daughter of Moses Beckstead and Hannah Hudson. Her parentage is stated by the record of her second marriage, when, as Martha McMillan, aged 26 years, widow, born in and resident in Williamsburg, daughter of Moses Beckstead and Hannah Hudson, she married 25 December 1893 at Chesterville, Dundas Co., William Jacob Drappo, aged 38 years, widower, born in and resident in Finch Tp., son of Peter Drappo and Catherine Barkley. Rosa/Rose McMillan, born August 1870, living with her parents in 1891 but not in 1901. Hosea McMillan, born ca. 1872-3, living with his parents in 1891 but not in 1901. 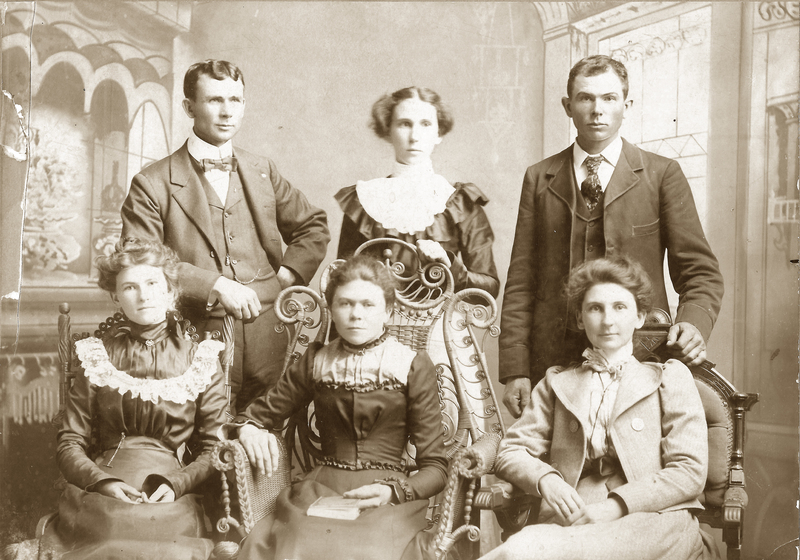 (front row:) Nettie, Martha, Minnie; (back row:) Angus, Hattie, Ezra. 7. James Henry McMillan, son of Daniel McMillan, of Williamsburg Tp., by the latter’s wife Anne Mooney alias Thom, was born 2 February 1841, died 26 January 1913, aged nearly 72 years, of pneumonia, and was buried in the Old Williamsburg Cemetery, Williamsburg Tp. His death record names his parents as Daniel McMilland and Nancy Thom. He married 21 December 1863 in St. Andrew’s Presbyterian Church, Williamburg, Margaret Barkley, born 1 July 1841 in Ontario, died 1 July 1907, on her 66th birthday, daughter of Joachim and Catharina (Barkley) Barkley. He was living with his parents in 1852 but has not been found in the census of 1861. The record of his marriage names him as James H. McMillan, aged 22 years, of Williamsburg Tp., and his wife as Margaret Barkley, aged 22 years, also of Williamsburg Tp. It is clear on chronological grounds that he is the James McMillan (called James H. McMillan in 1901) who appears in the censuses of 1871, 1881, 1891, and 1901, in which he is called a sawyer in those of 1881 and 1891, and a farmer in the others. Furthermore, he lived close to his brothers William and John. The widowed James McMillan was living with his son Ezra in 1901, and this son served as the informant of James’s death. James William McMillan, born 1885, died 1955. He married Essie Ethel Thomas, and had issue. Ethel Lila McMillan, born 1889, died 1979. She married Franklin J. Bell, and had issue. Harry Ramsey McMillan, born 1892, died 1970. He married Lenore Merl Reed. Bessie R. McMillan, born 4 April 1896. Hattie B. McMillan, born 8 December 1897. James H. McMillan, born 28 July 1899. Sherman Grant McMillan, born 30 March 1902, died 2 August 1904, and buried in Old Williamsburg Union Cemetery. Martha Ellen McMillan, born 3 August 1870, baptized 2 April 1871 (IGI), living with her parents in 1901. Minnie May McMillan, born 5 June 1875, baptized 28 May 1876 (IGI), died 1946. She was living unmarried with her parents in 1901. According to the “Our North Country Roots” website, she married William Farrell, and had a son, Arthur Farrell. Muriel N. Oshier, died young on 26 April 1899, and buried with her mother. Mary R. Oshier, born 6 December 1899, died 8 December 1904, 11 days before her mother, and buried with her mother. Nettie Grace McMillan, born 21 March 1881, living unmarried with her parents in 1901. 8. George H. McMillan, of Orchardside, Williamsburg Tp., son of David and Fanny (MacAulay) McMillan, was born 17 March 1830 in Ireland, was still alive in 1905, and was possibly the one of this name who died 3 February 1912 in Williamsburg Tp. He married (1) 26 December 1854 in St. Andrew’s Presbyterian Church, Williamburg,, Lana Elizabeth Barkley, born ca. 1833-34 (aged 20 at her marriage), who is not listed with him in the 1861 census and was presumably dead by that time. At the time of their marriage both parties were of Williamsburg Tp. He married (2) 11 November 1861 in St. Andrew’s Presbyterian Church, Williamburg, Catherine Barkley, born 16 July 1838 in Ontario, of Dutch or German ancestry, died 29 July 1908, and buried in Old Williamsburg Union Cemetery, daughter of John H. Barkley, of Wiliamsburg Tp., by the latter’ wife Amelia Deeks. At the time of their marriage both parties were of Williamsburg Tp. George McMillan, who was brought by his parents to Ontario, apparently in 1837, is listed next to them in all the censuses of Williamsburg Tp. from 1861 through 1901, in which he is called a farmer and his religion given as Presbyterian. On 9 November 1853 he purchased from the Crown the east half of lot 13 in the 8th concession of Williamsburg Tp., and a map of 1879 shows him as the owner of the eastern 5/8 of this lot 13. Because his marital status was carelessly left blank in the 1861 census, and no wife is listed with him therein, it is unclear whether he was then still married, or was already a widower. I started out to face the world when thirteen years of age and early engaged to cut the timber from three acres of land for which I was to receive five dollars per acre. While thus engaged my board was potatoes and buttermilk, until the last week when my employer threshed some wheat and buckwheat, on the level sod with a span of horses; cleaned it with a hand-fan, took it to the mill at Waddington, got it ground into flour, and then we had bread. I took a similar job from Jeremiah Marcelis and was to pay extra board if my time exceeded nine days per acre. Thus when the job was finished only ten dollars was due to me. Beside this I broke my axe and had to pay Richard Allen, of Morrisburg, one dollar for fixing the same. Mr. Marcelis gave me an order for ten dollars for goods at Henry G. Merkley’s store at Morrisburg and [I?] carried my whole purchase home in a scantily filled handkerchief. Going back still earlier, a trip to Armstrong’s Mills (Chesterville) comes to mind. In 1838 (Uncle) Dan McMillan and I with an ox team and cart went to Armstrong’s Mills with a small grist. The condition of the roads can be judged from the fact that the journey occupied a day. Arriving there in the evening we had to wait until the following day and having no money to pay for our board or lodging, Mr. Armstrong lent us some flour with which Mrs. Armstrong baked us a small cake and also gave us some milk. This we ate with a relish, after which we lay down and slept all night on the bags. Next morning Mr. Armstrong tolled and ground our wheat, took out the flour he had loaned us the previous evening and home we started. I also remember the visit of the tax collector to my father’s house. Our tax was one dollar, and we at once set to work to thresh on the sod enough oats to pay the call. I then engaged with a neighbor for two days in payment for a horse and cart to take the oats to Bell’s Corner, where Squire Bell paid us for the eight bushels which we threshed one dollar, just enough to pay the taxes. John McMillan, said to have been baptized 27 June 1855 in Williamsburg Tp. (IGI), died 1860, aged 4 years, “cause of death not [k]nown,” according to the entry for his father in the 1861 census. Catherine McMillan, born 12 February 1857 (per her death record) but in February 1859 (per 1911 census), died 15 October 1946 at Ottawa, Carleton County, Ontario, of myocardial failure, and buried in Morewood Presbyterian Church Cemetery, Morewood, Stormont, Dundas and Glengarry United Counties, Ontario. Her death record names her parents as George and Laney Elizabeth McMillan. She is found in her parents’ household in the 1871 census, but not in 1881. She married by 1877, John George Smirl (or Smirle), born in October 1854 in Ontario, died in 1918, and buried with his wife. He is found as a farmer in the 1881 census of Winchester Township, Dundas County. He is also is called a farmer in the 1886 birth registration of his daughter Catherine. At the taking of the 1901 census, John was absent from the household. They are found in the 1911 census under the spelling Smirle. Jane A. Smirl, born 1877-78 (aged 23 in 1901, 33 in 1911); still living unmarried with her parents in 1911. George McMillan Smirl, born 1879 at Morewood. He is found with his parents in 1901, but not in 1911. He married Lauda Clare Sparham, and had issue. Lena M. Smirl, born 1881-82 (aged 19 in 1901) in Ontario; not found with her parents in 1911. John Dougalt Smirl, born 19 March 1887 at Winchester Springs, Dundas County. He is not found with his parents in 1911. Catherine Smirl, born 19 December 1886 at Winchester Springs, Dundas County; not found (at least under this name) with her parents in the 1901 census. Lizzie V. Smirl, born 1886-87 (aged 14 in Ontario); not found with her parents in 1911. James Henry Smirl (or Smirle), born 1891-92 (aged 9 in 1901, 30 in 1922); still living with his parents in 1911. As James Henry Smirle, aged 30, insurance agent, son of John Smirle and Catherine Macmillan, he married 11 November 1922 at Ottawa, Carleton County, Ontario, Elsie Jane Garvin, born 1901-02 (aged 20 in 1922), daughter of Thomas Garvin and Ellen Jane Boyd. James Nicoll, Jr., born 15 March 1892 in Alberta. Jeanie Nicoll, born 15 June 1894 in Alberta. George Nicoll, born 10 July 1895 in Alberta. Archibald Nicoll, born 1 October 1897 in Alberta. Amelia Nicoll, born 15 July 1899 in Ontario. John McMillan, born ca. 1863-4, still living unmarried with his parents in 1881, but not in 1891. Archibald P. McMillan, born 22 April 1870, still living unmarried with his parents in 1901. Simon C. McMillan, born 8 January 1872, living unmarried with his parents in 1901. George B. McMillan, Jr., born 17 February 1873, living unmarried with his parents in 1901. Amelia McMillan, born 20 July 1875, living unmarried with her parents in 1901. Alice McMillan, born ca. 24 May 1878, living 1901. Velma Rose McMillan, born 24 December 1881, living 1901. 9. Daniel C. McMillan (known as “Little Dan” or as “Daniel David”), son of David and Fanny (MacAulay) McMillan, was born ca. 1835-37 in Ireland, died 2 August 1924 “in the U.S.A.” (according to his tombstone), and was buried in the Old Williamsburg Union Cemetery; the age of 92 years, 4 months, 28 days, attributed to him on his tombstone is clearly an exaggeration. His death does not appear to have been properly registered. He was married 1 December 1857 by the Rev. Eli Woodcock, Methodist Episcopal minister, to Margaret Merkley, born ca. 1839-40 in Ontario, of Dutch ancestry, died 1871-81, almost certainly a daughter of John Henry Merkley, of Williamsburg Tp., by the latter’ wife Catharine (?) Ouderkerk. Daniel McMillan, who should not be confused with his first cousin and exact contemporary Daniel McMillan (no. 2.iii), was brought by his parents to Ontario, apparently in 1837, and is listed near them in all the censuses of Williamsburg Tp. from 1861 through 1891, in which he is called a farmer and his religion given as Presbyterian. A map of 1879 shows him as the owner of the west 3/8 of lot 13 in the 8th concession, adjacent to the land of his brother George. He was widowed by 1881, and in 1891 was still not remarried. Catherine McMillan, born ca. 1857-9, living 1871 but not listed with her father in the 1881 census. (apparently) Elizabeth McMillan, said to have been baptized 3 August 1861 in Williamsburg Tp. (IGI), but not found with her parents in the 1871 census. Nancy McMillan, born ca. 1862-3, living 1881, but not listed with her father in the 1891 census. Margaret McMillan, born 6 July 1891. Robert McMillan, born 6 August 1893 in the U.S.
Frank C. McMillan 18 Jan 1907 in Dundas County. William McMillan, born ca. 1867-8, still living unmarried with his father in 1891, when he was a millwright employing one person. Lettie Ivalene McMillan, born 9 December 1894 in Williamsburg Tp., died by the taking of the 1901 census. Wilfrid Laurier McMillan, born 23 May 1896 in Williamsburg Tp., died ____. Adelbert/Delbert Stanley McMillan, born 24 February 1898, died ____. Gilbert Addison McMillan, born 22 December 1899, died ____. Gerald Miles McMillan, born 6 January 1901, died by the taking of the 1911 census. Kenneth McMillan, born 8 May 1902 (registered as Serenus R. McMillan), died ____. He is the father of Donna McMillan. 10. William Arthur McMillan, son of William McMillan and Delia Sipes, was born 11 January 1870, and died 28 June 1953. He married 18 September 1895 at Hallville, Ontario, his first cousin once removed (through the Sipes family), Anna Shaw, born 30 April 1875 (per 1901 census) at Hallville, Ontario (per marriage record), of Irish ancestry, daughter of Hugh Shaw (1852-1949) and Maria Hyndman (1856-1937), granddaughter maternally of John Henry Hyndman and Lucretia Sipes, and great-granddaughter of Andrew Sipes, Jr., and Maria Doran aforesaid. (John Henry Hyndman was a son of Joseph Alexander Hyndman, a brother of Robert Hyndman who married William Arthur McMillan’s grand-aunt, Jane McMillan, above.) William was living with his parents in 1891, and is found beside them in the 1901 census. At the time of his marriage, the record of which names both sets of parents including the maiden surnames of the mothers, the groom was a farmer, of Williamsburg, and the bride was of Hallville, he birthplace; the witnesses were Mary Ann R. Shaw, of Hallville, and Fred McMillan, of Williamsburg. They were enumerated in Williamsburg Tp. in 1901, at which times his parents were living with him. In the 1907 birth record of his son Hugh, this man is called Arthur Shaw, farmer, his address being given as Williamsburg in one place and Elma in another. As “W.A. McMillan, [of] Elma” this man served as informant of the death of his father in 1918. Donald Black, born 25 August 1926; married Gladys Audrey Beggs. Marguerita Elizabeth Black, born 2 January 1929; married Alan Douglas Howarth. Sylvia Rose Black, born 21 October 1932; married William Remple. McMillan Alexander Carkner, born 1927, died same year. Arthur Russell Carkner, born 1933; married Beatrice Edna Boulerice. Jay Milton Carkner [twin? ], born 1935; married Helen June Murray. Lois Ann Carkner [twin? ], born 1935; married Paul Orville Barkley. At the Ottawa Civic Hospital on Wednesday, July 4, 2007, Roma McMillan (nee Clarke) of Ottawa. Beloved wife of the late Hugh McMillan. Dear mother of June (Rudy) Boulerice of Morrisburg and Joye (James) Oswald of Vankleek Hill. Beloved “Gramma Mac” of 11 grandchildren and 20 great-grandchildren. Predeceased by a son Roger, sisters Queenie Stuart and Freda Hawkins and brothers Douglas and James Clarke. Also survived by nieces and nephews. Roma enjoyed a long and illustrious musical career which began at an early age. As a young woman she participated in 15 broadcasts with the Montreal Philharmonic Orchestra. During her lifetime she won over 200 trophies, recorded six albums of fiddle music and composed many fiddle tunes including the Lake St. Lawrence Waltz and the Upper Canada Jig…. In addition to her musical accomplishments she served as the Past Worthy Matron of the Order of the Eastern Star, Morrisburg, and the National Secretary of the Federated Women’s Institute of Canada…. The soundtrack of Roma McMillan’s life — fiddle music — began in wartime sorrow and evolved into catchy rhythms and cheery tunes that earned her more than 200 trophies and a handful of honours. As a girl, Ms. McMillan was introduced to the violin after her only uncle was killed in the First World War. Her older brother, Douglas, inherited their uncle’s violin, and it was shipped to the family’s home in Lachine, Que. When Douglas didn’t take to the instrument, Ms. McMillan convinced her mother to let her give it a try. Ms. McMillan, then seven years old, dusted it off, named it Henrietta and the rest is … history…. By the time Ms. McMillan was 18, she completed 15 broadcasts with the orchestra before leaving town with her other love, a Holstein farmer from Ontario named Hugh. After the two married in 1935, they moved to Elma, Ont., where Ms. McMillan’s concert violin changed its tune and old-time fiddle became more her style. The transition was brought on after Mr. McMillan levelled with his wife. “My husband said, ‘If you want people to listen to you, you’ve got to get away from the classical stuff; you’ve got to play old-time,’” Ms. McMillan told the Citizen in 2003. Before moving to rural Eastern Ontario, the only exposure Ms. McMillan had to old-time fiddle music was as a teen, after tragedy sent her to hospital. She was 15 years old when her family was involved in a terrible car accident. Ms. McMillan suffered a fractured skull, and her mother was killed…. The group, the Elma Serenaders, was a hit, and over the years, Ms. McMillan’s quick-fiddlin’ ways were recognized with a number of awards. Ms. McMillan was named Most Entertaining Fiddler at the Canadian Open Championships in 1988, and was awarded the Canadian Grandmasters Fiddle Championship lifetime award as well. She has also been inducted into the North American Fiddlers Hall of Fame, the New York Fiddlers Hall of Fame and the Ottawa Valley Country Music Hall of Fame. After being recognized by the Ottawa Valley Country Music Hall of Fame, her profile in a Nepean newspaper headline caught the attention of NBC producers at The Tonight Show with Jay Leno in 2003. “Someone must have seen her picture in the paper and cut it out and sent it down to Jay Leno,” Ms. Oswald figures. At the top of the article was an eye-catching quote from Ms. McMillan that apparently gave Mr. Leno quite a chuckle. It read, “I have a bowl of porridge every morning and fiddle with younger men in the afternoon.” … While her appearance on The Tonight Show may have been her highest-profile appearance, it was her 2001 concert at former governor general Adrienne Clarkson’s garden party at Rideau Hall that was said to be the highlight of her career…. Roma Clarke was born on July 5, 1911. The middle child, she was raised in Lachine with her siblings Queenie Stuart, Freda Hawkins, Douglas Clarke and James Clarke. She and her husband had three children, two daughters and a son before Mr. McMillan was killed in a farm accident in 1974. After her husband’s death, Ms. McMillan moved to Ottawa, where she worked, lived and fiddled for more than 30 years…. Ms. McMillan was predeceased by her son, Roger, who died from a malignant brain tumor in 2001. She is survived by her two daughters and sons-in-law, 11 grandchildren, 20 great-grandchildren, and many nieces and nephews. The 95-year-old suffered a stroke on June 26 and died on Wednesday, the day before her 96th birthday…. June Ann McMillan, born 29 June 1936, alive in 2007. She married 28 November 1958, Rudolphe Joseph Boulerice. They were living at Morrisburg at the time of her mother’s death in 2007. Bertha Joye McMillan, born 28 December 1937. She married August 1957, James Eric Oswald. They were living at Vankleek Hill at the time of her mother’s death in 2007. Douglas McMillan, born 1941, died same year. Roger McMillan, born 1939 (per his tombstone), “who died from a malignant brain tumor in 2001” and is buried in South Gower Cemetery. William Arthur McMillan, born 4 March 1937, died same year. John Hyndman McMillan, born 15 April 1938, living 15 April 2003. He married Marian Grace Gray. Mary Elizabeth McMillan, born 25 December 1941, living 15 April 2003. She married Gordon Ronald Whittaker. Martha Ann McMillan, born 1 October 1943, died 7 August 1956. 11. George Melvin McMillan, son of John McMillan and Permelia Armstrong, was born 10 May 1862, and died 13 May 1950. He was living with his father in 1881 but not in 1891. He married 29 June 1886 in St. Peter’s Lutheran Church, Williamsburg, Florence Priscilla Barkley, born March 1865 in Williamsburg Tp., died 1955. They were enumerated in the 1901 census and in the 1911 census. George McMillan, then of Dunbar, served as the informant of his father’ death in 1915. Charles Lee McMillan, born 11 November 1887, died 1919, and buried in Maple Ridge Cemetery, Winchester Tp. He was still living unmarried with his parents in 1911, but married 1917, Bessie Myrtle Dillabough, born 9 July 1890, of unknown parentage. A daughter, Clara Leora Grace McMillan, born 17 August 1917, died 31 December 1918, is buried in Old Williamsburg Union Cemetery. David Graham, born 1967 at Winchester. Joshua Thomas Miller, born 28 May 2001 at Winchester. Jonathon Thomas McMahon, born 3 June 1985. Tiffany Jane Genier, born September 1, 1980; married Craig Smith. One child, Cooper Smith. Ryan Edward Genier, born May 12, 1983. Ashley Lynn Genier, born August 16, 1984. Kiersti Anna McMillan, born 21 June 1990. Mackenzie Dean McMillan, born 20 September 1992. Kyler Mark McMillan, born 17 May 1990. Brittney Dawn McMillan, born 26 July 1991. Joseph Jackson Daniel McMillan, born 7 October 2001. Eva R. McMillan, born 19 August 1893 (per 1901 census), died 1978. She was still living unmarried with her parents in 1911, but subsequently married Nathan Casseman. Viola Elizabeth McMillan, born 14 July 1895 (per 1901 census). She was still living unmarried with her parents in 1911, but subsequently married Roy Edward Elliott, born 1892, died 1958. (daughter), born 20 September 1897, died next day. Robert McMillan, born 4 November 1898, died 27 November 1898. Mary Edith McMillan, born 30 January 1900 (per 1901 census), died 16 October 1911. 12. William Hill McMillan, Daniel McMillan, Jr., and Susannah Hill, was born 1857, died 1933, and was buried with his wife in Goldfield Cemetery, lot 10, concession 5, Winchester Tp., Dundas Co. He was still living with his parents in 1881. He married 4 December 1883 in Williamsburg Tp., Margaret Ann Beckstead, born 1860, died 1936, daughter of Moses Beckstead, by the latter’s wife Hannah Hudson. He is called a stone-cutter in the census of 1891, when his mother-in-law, the widow Hannah Beckstead, was a member of his household. He is also called a stone-cutter in the birth record of his twin sons, Smith and Ford (1895). He appears in the 1901 census of the township. Jeanette McMillan, married ____ Kile. They are the parents of Rocky Kile, of Winnipeg, Manitoba. Rhonda McMillan married name Sorensen. No children. Richard Grant McMillan, married Shirelle Murdock. Children: Brandon, Milissa. Christine McMillan; married (1) ____ Killick; married (2) ____ Smith. Children: Brooklynne Killick, Boston Smith. Dennis McMillan, born 22 May 1941 at Grand Prairie, Alberta. Garth McMillan, born 5 May 1955. Gertrude McMillan, born 1912 in Ontario, living at Cold Lake in 2006. Edwin McMillan, born 1914 at Kelfield, Saskatchewan, living at Lethbridge, Alberta, in 2006. He married Julie____, and were last known living in Lethbridge. A daughter, possibly named Gertrude, was last known to be living at Sault Ste. Marie, Ontario. Vera McMillan, born 1916 at Kelfield. Russell McMillan, born 1918 at Kelfield, living (June 2006) at Cold Lake. He married Norma ____. They live at Cold Lake, Alberta. Elery Lane McMillan, born 27 March 1915, died (unmarried) 9 July 1963, and buried with his parents in Paul’s Hill Cemetery. He was a government employee. William Blaine McMillan, born 24 February 1921, died 15 October 2001 at Etobicoke, Ontario, and buried in Memorial Gardens, Etobicoke. He married 31 July 1943, Mildred May Wilson, born 10 June 1916 at Ottawa, Ontario, died 8 June 2007, 2 days short of her 91st birthday, at the Queensway Carleton Hospital, Ottawa. Her husband was a bank manager. For some time prior to her death she was living at the Stillwater Creek Retirement Home, Richmond Road., Ottawa. William Anthony McMillan (Liam) born Jan 16, 1992, Ottawa, living (2006) at Iroquois, Ontario. Andrew Grant McMillan Brown, born 9 April 1987 at Almonte, Ontario, living (2006) in Carleton Place, Ontario. Natalie Dale Coleman, born 6 August 1985. Stephanie Brianne Coleman, born 22 April 1987. Brittany Gwynne Coleman, born 25 September 1989. Kenton Glenn Coleman, born 30 March 1993; living at Avonmore. Milton Pollock. He married Eileen MacLean, and had three children. Hugh W. McMillan, born 1891, died 1954, and buried with his wife near his parents. He married Jennie Christina Pollock, born 18 March 1892, died 1976, sister of his brother-in-law Daniel Pollock. Issue: Hugh McMillan and his younger brother Smith operated farms next to each other at Goldfield. Carol Ann Winters; married Stirling McElheran, of Morewood. Marjorie Winters; married Jeff Allen Walsh, of of Scarborough. W. Smith McMillan (twin), born 26 May 1895, died 1957, buried near his parents. According to the “Our North Country Roots” website, he married Muriel Sadie Helmer. Issue: Smith McMillan and his brother Hugh operated farms next to each other at Goldfield, Smith’s land having been his parents’ homestead. Lana Marcellus, married Ray Larsen. They have a son, Dan. Carol Marcellus, living at Aylmer, Quebec. Ford McMillan (twin), born 26 May 1895, died (without issue) 18 December 1983, and buried with his wife in Finch Community Cemetery. He lived in Finch township, and was a butcher. He married Annie Cameron, born 1895, died 1977. Catharine McMillan, married 7 November 1888 at Chesterville, Charles Thornton. Duncan B. McMillan, son of Alexander B. McMillan and Isabella ____, was born 1842-43 (aged 23 in 1866) in Finch Tp., and died before 1853. The names of his parents are given in his marriage record. He, being then of Finch Tp., married 9 January 1866 in Dundas Co., Catharine Parker, born about 23 February 1834 at Chatham, Quebec, died 6 July 1897, aged 63 years, 4 months, 13 days, and buried with her second husband in Old Williamsburg Union Cemetery, having married secondly 31 December 1853 in St. Peter’s Lutheran Church, Wiliamsburg Tp., Joseph Bedsted, died 4 August 1864, aged 63 years, 4 months, 13 days. According to her marriage record, in which her age is grossly understated as 21 years, she was then of Finch Tp., and was a daughter of Hugh and Catherine (____) Parker. Margaret Permelia M. McMillan, born 22 June 1840 in Finch Tp., died 14 June 1926. She married George Aaron Beckstead, born 7 January 1835, died 3 August 1900, and both are buried in Old Williamsburg Union Cemetery. They had issue. James J. McMillan, born 3 March 1847 in Ireland, died 1934, and buried with his wife in Grantley United Church Cemetery, Williamsburg Tp. He was still living unmarried with his father in 1871, but he married by 1874, Sarah E. Adams, of Irish origin, born 1848 in Ontario, died 1917. They are enumerated with four children in the 1881 census of Williamsburg Tp., with seven children in that of 1891, with eight children in that of 1901, and with four children in that of 1911. Edgar McMillan, born ca. 1849-51 in Ontario, still living unmarried with his father in 1871, but not in 1881. We have not located him in the 1881 census of Ontario. Osborn McMillan (called John in 1861), born 17 March 1855, died 9 February 1927, and buried with his wife in Grantley United Church Cemetery, Williamsburg Tp. He was living unmarried with his father, in 1871. He married 29 July 1878 at Osnabruck, Mary Elizabeth Shaver, said to have been of Irish parentage, born 13 April 1858 in Osnabruck Tp., Stormont Co., Ontario, died 13 March 1925, daughter of Jacob and Christie Anne (____) Shaver. In the record of their marriage, which names both sets of parents without however supplying the maiden surnames of the mothers, he is called a farmer, born in Osnabruck Tp. and residing in Williamsburg Tp. (we suspect the latter statements should be reversed), and she as born in and residing in Osnabruck Tp. ; the witnesses were Abraham Shaver and Jane Shaver, both of Williamsburg. They are enumerated very close to his father, probably in adjacent households, in the 1881 and 1891 censuses. In 1881 they had five children. Henry McMillan, born ca. 1858-59, living with his father in 1861 but not in 1871. Margaret McMillan, born ca. 1861-62. David McMillan, of Williamsburg Tp., farmer, born 1826-27 (aged 68 in 1895) in co. Armaugh, Ireland, son of James McMillan and Margaret McConnell, widower married (2) (as her second husband) 21 June 1895 at Morrisburg, Malinda (Baker) Beckstead, born 1853-54 (aged 41 in 1895) in Williamsburg Tp. (and still resident there at the time of their marriage), daughter of Jacob Baker and Eliza Cramer. The witnesses were E.B. Timberlake and Maria Dillabough, both of Morrisburg. 1. J. Smyth Carter, The Story of Dundas; being a history of the county of Dundas from 1784 to 1904 (Iroquois, Ontario, 1905), pp. 433-4. 2. Various records of North Williamsburg/Williamsburg St. Andrew’s Presbyterian Church, Family History Library microfilm no. 008,121,372, items 4-11. 5. 1861 Census of Canada, Ontario, Dundas Co., Mountain Tp., enumeration district 8, p. 61; Library and Archives of Canada microfilm no. C-1014. 6. We are grateful to Jeannie Kurtz for pointing out this possibility. 7. Information from Jeannie Kurtz. 8. Dundas County death registrations, 1895, 016690, which does not state her maiden surname or the name of her husband. We became aware of this record through Randy Mack Hyndman, Samuel Hyndman [born] 1762 Dunglady, County Derry, Ulster, available online at http://familytreemaker.genealogy.com/users/h/y/n/Randy-M-Hyndman/. It seems likely, judging from a published index, that the identification of the wife of Robert Hyndman as Jane McMillan was made in Nancy C. Hyndman, The Hyndmans of Mountain Township (s.l., n.d.), which we have not seen. Another genealogy not seen by us is Ellen Dangerfield, Descendants of Samuel Hyndman. 9. This and subsequent statements concerning tombstones in South Gower Cemetery were originally taken from Teresa McLellan, McLellan Family Tree, at http://freepages.genealogy.rootsweb.ancestry.com/~riman/mclellan/ teresahomepage.htm. There are now photographs of the tomsbtones of Jane (McMillan) Hyndman and her husband at Find A Grave. 10. Death notice of Mrs. Robert Hyndman, Kemptville Weekly Advance, 28 March 1895, transcribed in “Death notices from the Kemptville Weekly Advance, 1891-1895,” formerly available online at http://www.afhs.ab.ca/data/ontario/obituaries/obits_1891-1895.pdf. 11. Various Internet sources show that Samuel Hyndman died 17 October 1843, and is buried in South Gower Cemetery. 12. Death notice of Joseph Hyndman, Kemptville Weekly Advance, 13 May 1897, transcribed in “Death notices from the Kemptville Weekly Advance, 1896-1900,” formerly available online at http://www.afhs.ab.ca/data/ontario/obituaries/obits_1896-1900.pdf. 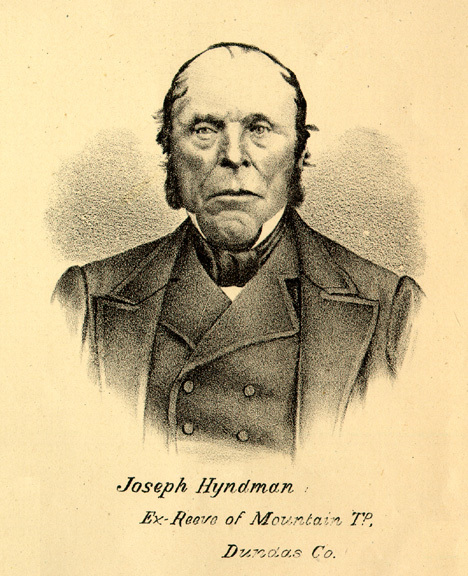 A portrait of Joseph Hyndan, extracted from Illustrated historical atlas of the counties of Stormont, Dundas and Glengarry, Ont. (Toronto, 1879), p. __, is available at http://digital.library.mcgill.ca/CountyAtlas/images/Portraits/sto-jhyndman.jpg. 13. Death notice of Hezekiah Clark, Kemptville Weekly Advance, 23 July 1896, transcribed in [Death notices from the Kemptville Weekly Advance, 1896-1900, available online at http://www.afhs.ab.ca/data/ontario/obituaries/obits_1896-1900.pdf. 14. 1852 Census of Canada, Canada West (Ontario), district 5 (Dundas County), subdistrict 36 (Mountain), schedule A (population schedule), p. 85, and schedule B (Agricultural Schedule), p. 120; Library and Archives of Canada microfilm reel C-11717. The entry from the population schedule has already been quoted above. 15. 1861 Census of Canada, Ontario, Dundas Co., Mountain Tp., enumeration district 8, p. 61; Library and Archives of Canada microfilm no. C-1014. For the identification of William Hyndman as a brother of Robert Hyndman see Teresa McLellan, “McLellan Family Tree,” as above. 17. 1881 Census of Canada, Ontario, district 102 (Dundas Co.), subdistrict E (Mountain Tp. ), Dundas, Ontario, division 2, p. 12; Library and Archives of Canada microfilm no. C-13228. 18. Illustrated historical atlas of the counties of Stormont, Dundas and Glengarry, Ont. (Toronto, 1879), p. __. 19. The story of Dundas, p. 327. 20. The Presbyterian [vol. 1], no. 11 (Nov. 1848), pp. 164-5. 22. “No. 13. Trip from Quebec to Montreal 27 July 1822,” St. Lawrence Steamboat Co., vol. 8, Car of Commerce, Apr. 27 – August 24, 1822, McGill University Libraries, Rare Books and Special Collections, MSS475; digital image available in the collection “Canada, St. Lawrence Steamboat Company Passenger Lists, 1819-1838” at Ancestry.com. A copy of this record was kindly supplied by K. Stuart Keys. 23. Carter, op. cit, p. 456, though we can find no confirmation of this statement in the Ontario Land Records Index. 24. 1852 census, piece 37, district 2, pp. 83, 85 in modern stamped numbering (reel C-11717). The agricultural portion of this census (p. 105) confirms that he held 200 acres in lot 19. 25. An editorial note in Dundas County Cemeteries: Old Williamsburg, p. 24, states that she was a daughter of Daniel McMillan and Nancy Thom; surely what was intended is David McMillan and Nancy Thom. 26. He is identified in a database by Michael R DeLaTorre, formerly at http://freepages.genealogy.rootsweb.com/~delatorre/persons.html. 27. 1871 Census of Williamsburg Tp., district 71, sub-district C, division 3, pp. 16-17. 28. 1881 census of Ontario, Dundas Co., Williamsburg Tp., district 102, Sub-district C, division 3, p. 37; PAC microfilm no. C-13227 [FHL microfilm no. 1,375,863]. 29. 1891 Census of Williamsburg Tp., Part 57-f, Division 3, p. 5. 30. Illustrated Historical Atlas of the counties of Stormont, Dundas, and Glengarry. 31. St. Andrew’s Presbyterian Church, Williamburg, marriage register; a better version of this record than that in Eastern District Marriages, as printed in the Ontario Register, 3:212, is defective, giving the date only as a year. 32. 1881 Census of Canada, Ontario, Stormont Co., Finch Tp., district 101, sub-district B, division 1, p. 54; PAC microfilm no. C-13227 [FHL microfilm no. 1,375,863]. 33. Dundas County marriage registrations, no. 011640. 34. Dundas County death registrations, 1895, no. 016689. 35. 1871 census, 71-C, division 3, p. 9. 36. However, his tombstone seemingly gives his age at death as 73 years, which is in poor agreement with these dates. 37. 1881 Census of Canada, Ontario, Stormont Co., Finch Tp., district 101, sub-district B, division 1, p. 51; PAC microfilm no. C-13227 [FHL microfilm no. 1,375,863]. 38. Illustrated Historical Atlas of the counties of Stormont, Dundas, and Glengarry. 40. Birth date calculated from age of 60 years given in the 1852 census. The reported ages of 74 years in 1861 and 83 years in 1871 are probably overstatements, which is known to be typical of the elderly in census records. 41. The ages reported for her in the censuses of 1852, 1861, 1871, and 1881  namely 45, 53, 65, and 72  do not form a consistent series. We have given greater weight in our estimate to the earlier reportings. 42. Death record, Archives of Ontario, MS-935, reel 49, entry no. 016127, which gives her age as 85 years, doubtless an exaggeration as it disagrees with census records. 43. 1852 census, piece 37, district 2, p. 105 in stamped numbering, as cited above. 44. Illustrated Historical Atlas of the counties of Stormont, Dundas, and Glengarry (Toronto: H. Belden, 1879). 45. 1852 census, piece 37, district 2, p. 95 in stamped numbering (reel C-11717); 1861 census, piece 39, district 5, p. 63 in stamped numbering (reel C-1014); 1871 census, district 71, subdistrict C, division 3, p. 22 (reel C-10006). 46. 1881 census, 102-C, division 4, p. 19 (reel C-13228). 47. 1881 Census of Canada, Ontario, Dundas Co., Morrisburg, district 102, sub-district D, p. 45; PAC microfilm no. C-13228 [FHL microfilm no. 1,375,864]. 48. 1891 Census, Dundas Co., Morrisburg village, Division 1, p. 32; PAC microfilm no. T-6331 [FHL microfilm no. 1,465,756]. 49. Dundas County marriage registrations, no. 1901_025879. 50. Her birthdate and that of her husband are from the 1901 census. 51. Dundas County death registrations, 1937, no. 013530. 52. Dundas County marriage registrations, no. 008817. Archives of Ontario R.G. 80, ser. 5, vol. E [Family History Library microfilm no. 1862896]. 53. 1891 census, 57-f, division 2, p. 11 (reel T-6331); 1901 census, district no. 54 (Dundas County), subdistrict F (Williamsburg Tp. ),, division 3, p. 9 (reel T-6463). 54. Dundas County death registrations, no. 037403. 55. 1852 Census of Canada, Canada West (Ontario), district 5 (Dundas County), subdistrict 36 (Mountain), schedule A; Library and Archives of Canada microfilm reel C-11717. Unfortunately, it is not clear whether the value in the “age next birth day” column is a 23 or a 25. 56. According to the 1901 census; this date is probably to be preferred to that of 1835 given on her tombstone. 57. The Bonaccorso Genealogy, at http://www.geocities.com/Heartland/Acres/4595/, from which we have taken a few details on their children, supplies the names of her parents as Andrew Sipes, Jr. (1807-1881) and Maria Doran (1809-1896), and her paternal grandparents as Andrew Sipes (Sr.) (1764-1831) and Mary Middagh (1767-1854). Most of these dates are corroborated by the Sipes family bible record, printed in “Family Records of Dundas County,” Ontario Register 1 (1968): 249-52, which states, “Andrew Sipes … was born 15th of May 1764 and his wife Mary Middaugh … was born on the 30th of January 1767. They were married on the 15th of June 1785. Andrew Sipes was drowned at Toronto 9th of April 1831…. 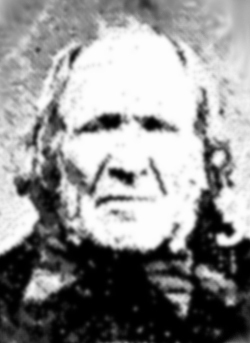 Andrew Sipes [Jr.] was born 29th January 1807.” Mary Middagh, wife of ____ Sipes, had an Order-in-Council dated 27 June 1800 to received land as the daughter of a Loyalist (Reid, The Loyalists in Ontario, 220). Her father was John Middagh (“Meddauch,” etc.) Sr., of Matilda Tp. The Sipes and Middagh families are briefly mentioned in Carter’s Story of Dundas, pp. 441, 437 respectively. 58. 1871 census, district 71, subdistrict C, division 4, p. 17 (reel C-10006); 1881 census, division 4, pp. 5-6 (reel C-13228); 1891 census, part 57-f, division 3, p. 2 (reel T-6331). 60. 1911 Census of Ontario, Dundas County, Williamsburg, enumeration district 12, p. 11; see below for transcription. 61. Dundas County death registrations, no. 016981. 62. Her parentage and place of birth are supplied by the record of her second marriage, cited below. 63. 1891 census, 57-f, division 3, p. 2. 65. 1911 Census of Canada, Ontario, Dundas Co., Williamsburg Tp., enumeration district 12, p. 10; see below for transcription. 66. Dundas County marriage registrations, 1924, no. 018521. The record is for the marriage on 12 November 1924 at Elma Methodist Church, Dundas Co., of Caroline [Sargeant] McMillan, aged 66 years, born and residing in Williamsburg Tp., daughter of John Sargeant and Elizabeth Barkley, and Peter Droppo, farmer, aged 68 years, born in Finch Tp. but residing in Williamsburg, son of Peter Droppo and Catherine Barkley. This record makes no mention of the parties’ previous marriages, but the groom, who was born 18 March 1856 and died 23 February 1929, is buried with his first two wives in Old Williamsburg Cemetery. All three of his wives, like himself, had Barkley connections, his first wife being Harriet Barkley and his second Ellen Barkley (daughter of Philip Barkley and Roseanne ____). 67. Dundas County Cemeteries: Old Williamsburg, p. 124, citing records of Winchester Springs Methodist Church, and an obituary notice of his wife. 69. Vernon’ Farmers’ and Business Directory for the counties of Carleton, Dundas, Glengarry, Lanark, Prescott, Renfrew, Russell, and Stormong, 18th ed., 1916-17 (Hamilton, Ontario), p. 158. 70. Wesleyan Methodist Baptisms, transcribed by Ida Reed, available online at http://freepages.genealogy.rootsweb.com/~wjmartin/ wesleyan.htm. 71. Dundas County death registrations, no. 039217; this record is also quoted in extenso by the editors of Dundas County Cemeteries: Old Williamsburg, p. 15. 72. Easter District marriages, as printed in Ontario Register, 3:208. 73. She is identified in an editorial note in Dundas County Cemeteries: Old Williamsburg, p. 15, which is also our source for her exact date of death. Henry Armstrong (1797?-1876) and Margaret Barkley (1798-1881) were married 3 August 1818 in St. Peter’s Lutheran Church, Williamsburg. She was a daughter of Peter Barkley (1763-1850), who is said to have come to Williamsburg Tp. from Albany, New York, by his wife Delia ____ (1757-1852). 76. There is a good treatment of this family in World Family Tree, vol. 19, from which we take much of our material. 77. Dundas County marriage registrations, no. 010475. 80. 1901 census of Canada, Ontario, district no. 54 (Dundas County), subdistrict F (Williamsburg Tp. ), division 6, p. 6. 82. Dundas County birth registrations, no. 020055. We follow this record in preference to the 1901 census, which gives the date as 26 September 1879. 84. Vernon’ Farmers’ and Business Directory for the counties of Carleton, Dundas, Glengarry, Lanark, Prescott, Renfrew, Russell, and Stormont, 18th ed., 1916-17 (Hamilton, Ontario), p. 158. 85. The place is given in the 1924 marriage record of his daughter Pearl. 86. 1881 Census of Canada, Ontario, Stormont Co., Finch Tp., district 101, dub-district B, division 1, p. 53; PAC microfilm no. C-13227 [FHL microfilm no. 1,375,863]. 87. Stormont, Glengarry & Dundas County marriage registrations, 1924, no. 018489. 89. Dundas County marriage registrations, no. 010475. 90. Dundas County marriage registrations, no. 011534. 91. 1891 Census of Williamsburg Tp., Part 57-f, Division 6, p. 20. This would seem to refute the statement in Dundas County Cemeteries: Old Williamsburg, p. 54, that Ezra was a son of Cornelius Barkley, born ca. 14 August 1836, died 12 September 1874, aged 38 years, 29 days, buried in Old Williamsburg Union Cemetery, who married 12 June 1862 in St. Andrews Presbyterian Church, Williamsburg, Abba Ann Becker, daughter of Philip and Elizabeth (____) Becker. 93. Dundas County Cemeteries: Old Williamsburg, p. 136. 95. St. Andrew’s Presbyterian Church, Williamburg, marriage register; a better version of this record than that in Eastern District marriages, as printed in the Ontario Register, 3:212. 96. “Margaret Allison, wife of Wm. Hill, died June 29, 1888, aged 78 years,” according to her tombstone in Old Williamsburg Union Cemetery. 98. Dundas County marriage registrations, 1876, no. 010428; this record was kindly brought to our attention by the couple’s great-grandson, K. Stuart Keys. 99. Dundas County marriage registrations, no. 010976. 100. Dundas County marriage registrations, no. 11495. 102. Vernon’ Farmers’ and Business Directory…, 18th ed., 1916-17 (Hamilton, Ontario), p. 158. 103. Dundas County marriage registrations, no. 011851. 104. Dundas County marriage registrations, 1895, no. 011895. 106. Dundas County birth registrations, no. 045503. 107. Dundas County marriage registrations, no. 011153. 108. Dundas County marriage registrations, no. 011639. 109. Dundas County marriage registrations, no. 015111. 110. Dundas County death registrations, no. 030990. 111. Records of St. Peter’s Lutheran Church, Williamsburg, as quoted by the editors of Dundas County Cemeteries: Old Williamsburg. p. 43. 112. Joachim Barclay Jun. married 25 December 1819 Caty Barclay, who died 11 September 1884, aged 83 years, and is buried in Old Williamsburg Union Cemetery. 114. 1901 census of Canada, Ontario, district no. 54 (Dundas County), subdistrict F (Williamsburg Tp. ), division 6, p. 4. 115. Most of our information on him is taken from Mary Jeanne Kurtz, Mary Kurtz Family Tree, at https://www.ancestry.com/family-tree/pt/pedigree.aspx?tid=72586245. 118. Vernon’ Farmers’ and Business Directory for the counties of Carleton, Dundas, Glengarry, Lanark, Prescott, Renfrew, Russell, and Stormong, 18th ed., 1916-17 (Hamilton, Ontario), p. 158. 119. Inventory of Brookside Cemetery, Waddington, NY, at http://freepages.genealogy.rootsweb.ancestry.com/ ~stlawgen/CEMETERY/Brookside/Brookside.HTM. This reference was kindly brought to our attention by Jeff Oshier. 120. Dundas County marriage registrations, no. 012128. 121. All information from Jeff Oshier. 122. Ontario civil death records index; original record not yet checked. 123. St. Andrew’s Presbyterian Church, Williamburg, marriage register; a better version of the record than that in Eastern District marriages, as printed in the Ontario Register, 3:212. 124. Amelia (Deeks) Barkley (1816-1882) is likewise buried in Old Williamsburg Union Cemetery; she rests beside her parents, John Deeks (1788-1862), “a native of Bury St. Edmunds, co. of Suffolk, England,” and his wife Catharine Merkley (1797-1874), daughter of Henry and Elizabeth (____) Merkley. “John Deeks was a soldier doing service under Wellington in the Peninsular War. In 1812 he came to Canada a British Red-coat,’ and assisted in maintaining the supremacy of the Union Jack here. At the close of the war he returned to the old land,’ but a few years later again came to Canada and settled on lot 32, concession 2 of Williamsburg.”  Carter, The Story of Dundas, 424. 125. 1861 census, piece 39, district 5, p. 63 in stamped numbering (reel C-1014); 1871 census, 71-C, division 3, p. 22 (reel C-10006); 1881 census, 102-C, division 4, p. 16 (reel C-13228); 1891 census, 57-f, division 3, p. 20 (reel T-6331); 1901 census, district no. 54 (Dundas County), subdistrict F (Williamsburg Tp. ), division 3, p. 6. 126. Ontario Land Records Index. Carter, op. cit., p. 457, gives the date as 1860. 127. Illustrated Historical Atlas of the counties of Stormont, Dundas, and Glengarry. 128. Carter, The Story of Dundas, 311. 129. Carter, The Story of Dundas, 399. The words in parentheses were evidently inserted by Carter. 134. Dundas County birth registrations, 1887, no. 033464. 135. Dundas County birth registrations, 1886, no. 022463. 136. Carleton County marriage registrations, 1922, no. 009002 [? stamped number, illegible]. 137. Dundas County marriage registrations, no. 011361. 140. Eastern District marriages, as printed in the Ontario Register, 4:108. 141. According to the entry for her in the LDS Ancestral File (entry no. J1MW-3S), which however contains an impossible birthdate for Margaret of ca. 1849 and calls her mother Elizabeth rather than Catharine. But that these persons were her parents seems to be confirmed by the fact that Margaret’s son Arthur was living with them in 1881. John Henry Merkley and Catharine Ouderkerk were married 23 October 1838 by the Rev. John Dickey, of the Presbyterian Church, Williamsburg (Eastern District marriages, as printed in the Ontario Register, 2:189). According to the same Ancestral File entry, John Henry Merkley was a son of Henry Merkley, of Williamsburg, by the latter’ wife Margaret, daughter of Christian Barkley. This Henry Merkley was the son of Jacob Merckel, a Loyalist settler from Schoharie Co., N.Y.; see James Croil, Dundas; or, a sketch of Canadian history (Montreal, 1861), pp. 133-4; The Story of Dundas, p. 434; William D. Reid, The Loyalists of Ontario (Lamberville, N.J.: Hunterdon House, 1973), pp. 221-2; Loyalist Lineages of Canada, 1783-1983 (Toronto, 1984), pp. 445-7; Henry Z. Jones, Jr., More Palatine Families (Universal City, California, 1991), pp. 181-3. We have not seen anything in print on the Ouderkerk family of Williamsburg, but one suspects they may have come from New York, where the name is common. 142. 1861 census, piece 39, district 5, p. 63 of stamped numbering (reel C-1014); 1871 census, 71-C, division 3, p. 22 (reel C-10006); 1881 census, 102-C, division 4, p. 17 (reel C-13228); 1891 census, 57-f, division 3, p. 20 (reel T-6331). 143. Illustrated Historical Atlas of the counties of Stormont, Dundas, and Glengarry. 144. In an earlier version of these notes, we erroneously reported him as remarried; this was based on a misreading of the 1891 census, in which his son John’s wife Annie was mistaken for his own wife. McMillian Robert   M  son  s.   August  6 1893   7  U.S.
146. Dundas County marriage registrations, no. 011742. 147. Dundas County birth registrations, no. 019711. John S. Marcellus, a mason, died 17 September 1918, aged 75 years and 10 months, and was buried in Old Williamsburg Union Cemetery. He married 19 December 1871, Jemima M. Hanes, died 20 January 1935 and buried with her husband, daughter of Josiah and Emaline Hanes. John S. Marcellus was a son of Christopher J. Marcellus, born 13 April 1815, died 24 May 1877 and also buried in the same cemetery, who married 4 December 1838, Eliza “Wilman” (i.e. Ulman). See the valuable editorial notes in Lynne & Mahlon Cook’s cemetery transcription. 149. Western Land Grants, 1870-1930, at http://www.collectionscanada.ca/02/02011102_e.html, citing Liber 478, folio 344, PAC microfilm no. C-6321. 151. Dundas County marriage registrations, 1894, no. 031283. 152. Dundas County marriage registrations, 1896, no. 035884. 153. Dundas County birth registrations, 1898, unnumbered. 154. Dundas County birth registrations, 1899, unnumbered. 155. Dundas County birth registrations, 1901, unnumbered. 156. Dundas County birth registrations, 1902, unnumbered. 157. Dundas County marriage registrations, 1895, no. 11640. 158. Dundas County marriage registrations, 1874, no. 10339: Hugh Shaw, 22, yeoman, born and residing in Mountain Tp., son of Hugh Shaw and Ann Wylie, married 22 Sept 1874 in Mountain Tp., Maria Hyndman, 18, born and residing in Mountain Tp., daughter of John Henry Hyndman and Lucretia Sipes; witnesses: Alva Corrigna and John Sipes, both of Mountain. John Henry Hyndman (1830-1866) was a son of Joseph Alexander Hyndman (1808-1897), brother of the Robert Hyndman who married Jane McMillan. For the identification of Lucretia Sipes as a daughter of Andrew Sipes, Jr., and Maria Doran, see Marianne (Arick) Senecal, Arick-Senecal, at http://wc.rootsweb.ancestry.com/cgi-bin/igm.cgi?db=arick-senecal. 161. Information from Pamela Longhurst Romanchuk, a kinswoman of John Milton Carkner. 162. 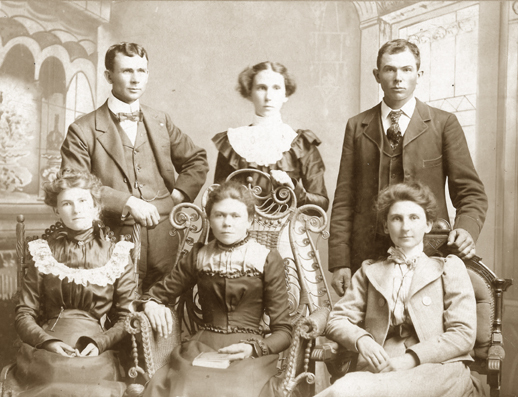 Dundas County birth registrations, 1907, no. 045492. 164. Death notice, Ottawa Citizen, 6 & 7 July 2007, available online at http://www.legacy.com/Can/Obituaries.asp?Page=LifeStoryPrint&PersonID=90253308, kindly brought to our attention by Sylvia (McMillan) Brown. 166. As to the last, see 2003 Citation Inductee: Roma McMillan, available online at http://www.ottawacountrymusichof.org/members/2003/ roma_mcmillan.htm. 167. Melissa Arseniuk, “Love of old-time music kept award-winning fiddler fit; In her 90s, she joked that ‘porridge and fiddling with younger men’ was the secret to her long life,” The Ottawa Citizen, 8 July 2007. 169. Death notice of Joseph Hyndman McMillan, Winchester Press, 2003, available online at http://www.winchesterpress.on.ca/Obituaries/2003/ McMillan,%20Joseph. 172. Dundas County birth registrations, no. 032595. 173. Andrew L. Dillenbeck & Karl M. Dallenbach, The Dällenbachs in America, 1710-1935 (St. Johnsville, N.Y., 1935), 394. 175. Vernon’ Farmers’ and Business Directory…, 18th ed., 1916-17 (Hamilton, Ontario), p. 158. 176. This record was provided by their grandson, Mark McMillan. 177. Information from Mark Andrew McMillan. 178. Information from Mark Andrew McMillan. 179. Dundas County marriage registrations, no. 011751. 180. Her mother, identified only as “Mrs. Moses Beckstead” (1822-1911), is buried with her. 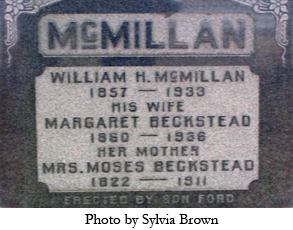 We know she was the widow Hannah Beckstead found in the household of her son-in-law in 1891; therefore she must have been Hannah Hudson, whose daughter Martha Beckstead married (1) Andrew E. McMilland and (2) William Jacob Drappo. 181. 1891 census, 57-f, division 6, p. 15 (reel T-6331). 182. 1901 census of Ontario, district 54 (Dundas County), subdistrict F (Williamsburg Tp. ), division 3, p. 9 (reel T-6463). 183. Information from Sylvia (McMillan) Brown. 184. Information from Sylvia (McMillan) Brown. 185. Information from her grandniece, Sylvia (McMillan) Brown. 186. Information from Margaret Cameron, who is not descended from the present McMillan family. 187. Information from his grandniece, Sylvia (McMillan) Brown. 188. Death notice, Ottawa Citizen, 14 August 2014, available online at http://www.legacy.com/obituaries/ottawacitizen/obituary.aspx?pid=172103113, kindly brought to our attention by Sylvia (McMillan) Brown. 189. Dundas County birth registrations, no. 031327. 190. Information from his grandniece, Sylvia (McMillan) Brown. 191. Dundas County birth registrations, no. 031328. 192. Information from his grandniece, Sylvia (McMillan) Brown. An image of their tombstone may be found at http://cornwallroots.info/cms/cornwall/tombstones/Tombstones_list.php. 193. Dundas County marriage registrations, no. 011513. 194. Dundas Co. marriage registrations, no. ____. 195. Editorial note in Dundas County Cemetery: Old Williamsburg, p. 94. 196. Colquhoun Cemetery [PDF], available online at http://www.empey.ca/lynne/Williamsburg/Cemeteries/colquhouncemetery.pdf. 197. 1861 census of Williamsburg Tp., piece 39, District 5, p. 57; 1871 Census of Williamsburg Tp., District 71, Subdistrcit C, Division 3, p. 35. 198. 1881 census of Williamsburg Tp., District 102, Subdistrict C, Division 4, p. 21. 199. 1891 Census of Williamsburg Tp., Part 57-f, Division 2, p. 19. 200. 1901 census, agreeing with the censuses of 1861 and 1881 in stating the place as Ireland, and with the year of birth given on his tombstone. 201. 1881 census of Williamsburg Tp., District 102, Subdistrict C, Division 4, p. 18.
name        gender age cond. relat. birthpl. father mother occ. 205. Dundas County marriage registrations, no. 010450. 206. 1881 census of Williamsburg Tp., District 102, Subdistrict C, Division 4, p. 21; 1891 Census of Williamsburg Tp., Part 57-f, Division 2, p. 19. 207. Dundas County marriage registrations, 1895, no. 011696.